The Workflow background engine processes deferred activities, notifications, wait activities and time out activities. We need to setup the Workflow background engine when setting up Workflow in our environment. Also we need to schedule the Workflow Background Process concurrent program to re-submit periodically. 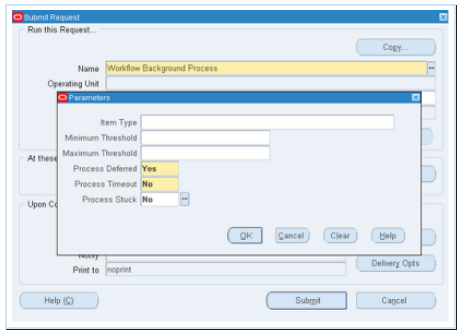 When scheduling the concurrent program, specify the Order Management work item types as the parameter so that it will only pick up the activities or notifications for Order Management work items. Define the Process Deferred parameter as Yes. Set all other parameters to No. Schedule this request to run most frequently. Define Process Time-out as Yes, and all other parameters as No. This can run less frequently. Define Process Stuck set to Yes and all other parameters as No. This can run less often. Use the Tools Menu and select the Workflow Status to view the current status of the workflow. When an order header workflow is error out, how to retry the workflow for the order? Go to workflow administrator, provide the item key (header_id) and submit to retry the WF for the corresponding order.